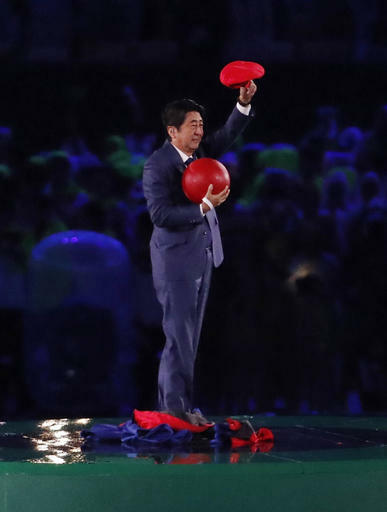 Japan Prime Minister Shinzo Abe did his best Mario Brothers impression at the Rio Games. Tokyo hosts the next Summer Olympics in 2020, so Japan put on an elaborate presentation at the closing ceremonies of the Rio Olympics. Shortly after the IOC flag was handed off from Rio to Tokyo, the video boards inside Maracana Stadium showed Abe, who said earlier that he could not attend the Rio Games in person, turn into Mario from the popular video game. Mario ran through the streets of Tokyo and arrived at a green tube, pulling out a map that showed Rio de Janeiro at the other end. With a red ball in his hand, Mario jumped into the tube and arrived in Rio with the familiar sound from the video game. Instead of Mario appearing, Abe rose up from the tube, holding a red ball and a red hat as the crowd roared its approval. The only glitch? After the presentation was over and Abe was gone, workers had a hard time removing the tube from the stadium floor. They were still trying to move it well into a speech by Carlos Arthur Nuzman, president of the Rio 2016 Organizing Committee.